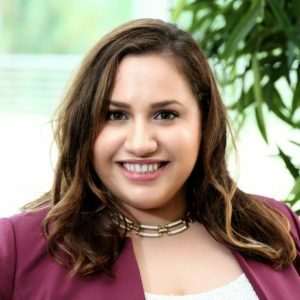 Ameerah Mukayed serves as the Diversity & Inclusion (D&I) Specialist at Tech Data Corporation, a global Fortune 100 technology distributor headquartered in Clearwater. Her responsibilities include providing oversight of Tech Data’s four employee resource groups, delivering cultural competence education, benchmarking Tech Data’s D&I progress, and collaborating with the Director of D&I on strategy. She also serves as Chair of Tech Data’s North American Diversity & Inclusion Council. Prior to Tech Data, Ameerah worked for the National Diversity Council for five years, most recently as Program & Communications Lead, overseeing programming within the Florida chapter and communications for the East Coast state chapters. Ameerah is actively involved in various organizations, including serving as Communications Chair for the Florida Diversity Council’s Tampa Bay chapter, as well as volunteering for Community Tampa Bay. Ameerah attended the University of South Florida, majoring in International Relations. She is a National Diversity Council Certified Diversity Professional (CDP).